Time for some updates about this new project I talked to you about - which name is now AirWars. I just finished converting Chris' long Daily Strikes Report Google Doc to a more data-friendly format. Soon, I'll release the whole batch of data in this Github repo, as CSV. Soon, too, we will have nice things to show you at airwars.org. The dataset has been designed to allow as many uses of the data as possible. 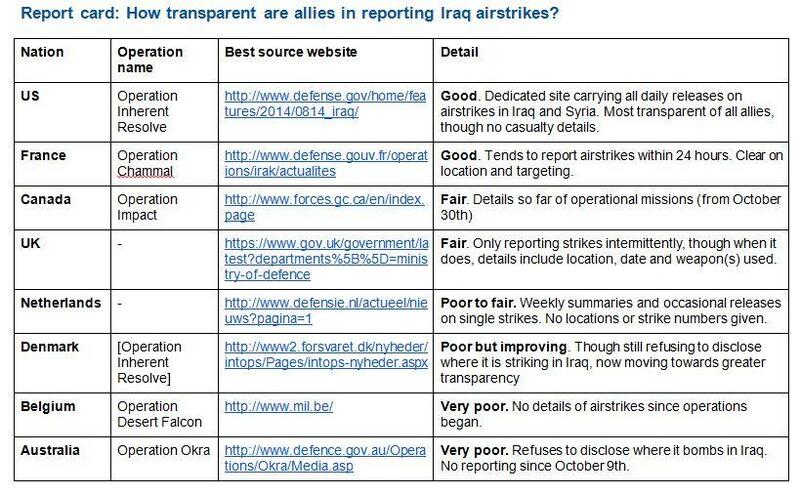 Our first goal for AirWars is to present a graphical overview of the war against IS, as well as continuing to maintain this crucial dataset monitoring the strikes, and continue to hold the coalition's members to transparency and accountability.